People have particular choices when it comes to shaving. Some prefer disposable razors for the job. Others entrust their shaving duties to their “Straight” cousins. And then, there are people like me who rely on the “Middle Child” of the family. The safety razors. I prefer these because I get to tune every part of the tool. Yes, right down to the blades. I prefer one of the best safety razor blades (Astra) for the job in combo with my good ol’ Merkur 180. One benefit of using the right blade is that you could switch between brands depending on your skin and beard type. However, select the wrong one and you end up stroking the razor on your face multiple times with no real results. Well, you do get nicks and cuts but that’s not why we shave, right? The definition of the “Right” blade changes from person to person. That’s why you see many (and I do mean MANY) blades trying to edge one another out. But very few candidates stack up to the challenge. 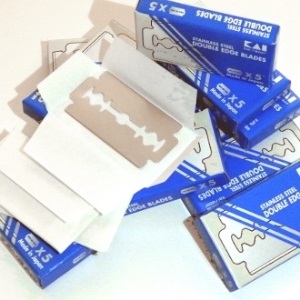 In this article, you’ll find 9 of the top safety razor blades that do! Also, I’ll be going over facts that make them the top dogs in the business. Without rambling too much, let’s get down to business. Honestly, pointing fingers wasn’t easy. I could’ve taken the easy route out and declared a reputed brand as a winner for this year. Instead, I decided to test each one of these 9 candidates before placing them on my list. Each of these blades come in multiple numbers in a package. So, here it goes! It’s not often that I kick my list off with one of the top brands when it comes to safety razor blades. 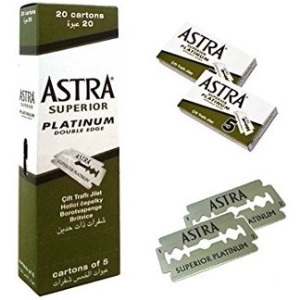 It seems like today is the case with Astra Platinum blades. I like the shiny look of the blades. Each blade reeks of quality unlike few of the products that are currently flooding the market. Do you know how many blades you’ll have at a price under $50? You’ll have four boxes. Each box contains precisely 100 blades. So, that’s 400 blades gift wrapped at one purchase. Happy? I know, I am! Also, each blade is made with intensive care. I could vouch for the quality of these products as well! Unlike some of the cheaper alternatives, Astra blades go well any “Double-Edge” razor. And no. People won’t have to deal with a weird angle that the blades usually create. As a result, people will have the “Perfect” shave that they crave first thing every morning. Whatever I say in terms of craftsmanship, it won’t be enough. These blades are smooth on your face. Yes, you’ll have a sharp object working on your facial hair. Yet, these won’t be rough on you. These are smooth. Gillette Astra doesn’t have rough edges or glassy steel that’d chip or break when put under pressure. Don’t worry about these blades catching rust. These are Russian-made. You can see the craftsmanship the moment you lay eyes on one of these. The makers went ahead and “One-upped” themselves with the wax foils. Yes, each of these blades is wrapped in a wax coating. It protects them from rust. Furthermore, each package is sealed. Don’t worry about moisture or humidity impacting the performance of these babies. They WILL remain in tip-top shape. It’s a guarantee from me. People will have to spend less money getting more of this product than others available. These blades are sharp and deliver close shaves that we’ve come to expect from Gillette product. These blades are of top notch quality and don’t chip away or break even when used rigorously. 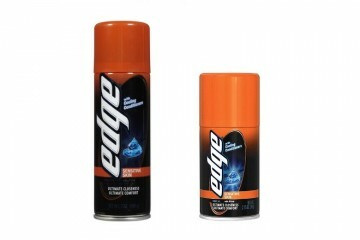 Gillette Astra fits each and every “Double-Edge” razor people use these days without problems. The blades are Russian-made. They use quality steel and “Hands’ Off” methods to craft these. Few of the users in my community stated that the shave quality decreases after three or four shaves. Care for a Swedish quality product? I know you do! What if I give you a quality brand with 9 months to a year worth of supplies to take care of your shaving needs? 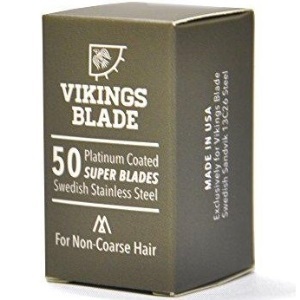 Well, VIKING BLADES is here with the Swedish brand of steel to provide shavers with quality blades. These are made with 13C26 steel with a platinum coating. This steel has improved hardness to cut close to our skins without causing irritations. These blades are not aggressive on your skin. People who are finding their feet in wet shaving should try these immediately. I favor 13C26 steel for a number of reasons. The steel is very sharp when molded in a blade. Also, blades made out of this type of steel are corrosion resistant. People won’t have to worry about these getting dull anytime soon. These blades won’t wear out or get chipped. That’s because the edges are hardened but the core is flexible. Make no mistake, these blades deliver a quality shave. But perform on an average level for those who have coarse hair. If you guys are used to with Feather or Astra blades, I’m afraid these won’t do much to satisfy you. Those are perfect for guys with coarse and in-grown hairs on their faces. Many of us worry about the safety of our faces as well as of the blades that we use. When not in use, these “Swedish Steel” blades are safe to handle. These things are double wrapped. The next time you are touching the sharp steel with bare hands, do so with the utmost confidence. Thinking of a high price for the quality VIKINGS BLADES provides? Well, as it turns out, these products are cheaper than you think. 50 blades will cost you less than $20. To think that I got a year worth of supplies of USA-made blades at this price got me hooked and inspired to try them. 13C26 steel gives these blades the hardness without taking away flexibility at its core. The same steel gives these blades supreme corrosion, wear and tear resistance than others. This VIKINGS BLADE product is perfect for people who are beginners in the art of wet shaving. One supply of this product will last from 9 to 12 months depending on how frequently you shave. These VIKINGS BLADE products are double wrapped so people can handle safely handle them. These blades can cause skin breakouts if users are not careful enough. For those of you who favor a life on the edge (figuratively and literally), here’s Feather Double Edge blade at number three when discussing best safety razor blades. As usual, people get a total of 50 blades at a price below $15. It’s reasonable I’d say. Passionate wet shavers know that “Feather” blades are made of Hi-Stainless Steel. A good thing about this material is that it makes these blades sharp. Sharp blades grant “Extremely” close shaves. On top of that, these products have a platinum coating. It preserves the sharpness for a long time. One more thing that the coating does is protecting the blades from rust. The coating doesn’t let moisture set in. On top of that, it helps the edges cutting down on coarse and in-grown hair in the trickiest corners of our faces. This is to be expected with a Japanese blade. “Feather” blades fit different types of razors. Don’t worry about blades falling on our faces at a difficult angle. However, I must mention that these products are aggressive. Users need to handle them with care. Be cautious when using one of these unless you are a pro. With the right single blade razor, Feather blades feel smooth and comfortable on our faces. But, as I said, one needs to be a pro at handling these blades. These blades come with a wrapping paper for safety. When one’s about to shave, he needs to apply some warm water to get the gummy adhesive off. One packet of the product contains five blades. With one blade, people can get 3 – 5 shaves. For me, it’s good enough since I shave two times a week. 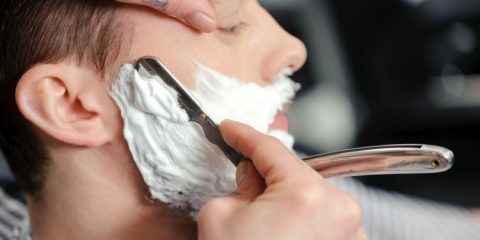 For more frequent shavers, the supply might run out sooner than expected. These blades work well with every double-edge razor. Including Merkur 25. 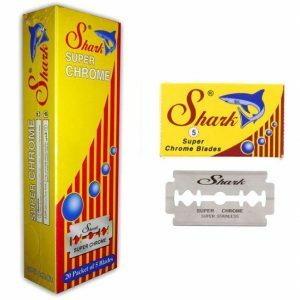 This is one brand which manufactures sharp blades that work well on most skin types. These blades can cut close to your skin and grant users the kind of “Close” shave that they crave. 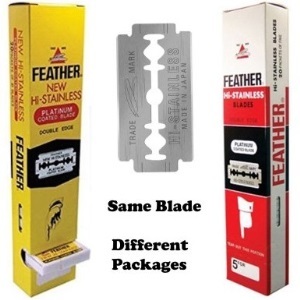 The platinum coating ensures that “Feather” blades don’t catch on to rust or moisture. Each of these blades grants me 3 – 5 shaves. So, 50 blades run a long time for me. Don’t worry about using a specific razor for these things. These blades fit just about every razor. “Feather” can be too aggressive for the sensitive skins of various users. There are people who wouldn’t mind going the extra mile when it comes to getting close shaves. That includes scouring the earth for the sharpest blades available. With the next brand on my list, the long and hard search of users should end. Let me give you “Kai” Stainless Steel blades from Japan. When I say these blades are “Sharp,” I mean it. One can’t expect anything less than “Quality” from a Japanese blade. When it’s made out of surgical steel, people know that they have a good product on their hands. Surgical steel allows makers to come up with thin-edged blades that cut close and cut well. These blades tackle in-grown hair as well as coarse ones. No matter how thick the stubble is, with an adjustable razor, these products go through them like a knife on butter. However, “Kai” isn’t as aggressive as Feather or Gillette Astra. For me, it sits right in the middle. This is great! People need to be careful with aggressive blades. One strong at a wrong angle can leave a deep cut on faces. Also, those with sensitive skins will find a great ally in this blade. Kai doesn’t cause rashes or red spots on our faces. However, use an aftershave lotion just to be on the safe side. Another reason for these blades to be so smooth is the fact that these don’t have that platinum coating. Platinum makes it so that moisture doesn’t sit on the blades. At the same time, it makes blades somewhat dull. With “Kai,” it’s not the case at all. I’m a bit lenient on my blades. That’s why I can except 6 – 7 shaves with these. The pickiest shavers will have 5 – 6 shaves with Kai blades before they behave like the normal everyday product. Surgical stainless steel grants people the sharpness that they need for a close shave. The blades sit at the midpoint when it comes to aggressiveness towards our skins. As always, Kai doesn’t cause any rash or red spots on your faces like so many aggressive blades. Kai blades are great for people with sensitive skin and face as a whole. These Japanese blades will grant you more shaves than some of the popular brands out there. To me, there’s nothing wrong with these products at all. 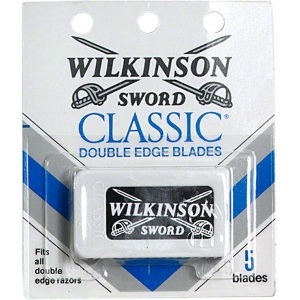 These “Double Edge Razor blades” are great for Merkur razors. Yet, these things find their ways into other products too. Merkur blades are a good fit for Edwin Jagger, Parker, Washi, and other razors. No, there won’t be any weird angles created by these blades. I can guarantee that myself. I’ve got to be honest with my readers. This blade is aggressive unlike some of the candidates on my list. However, Merkur doesn’t cause as much irritation as some of the popular blades. I’d place my bets on Merkur rather than some of the cartridge razors that are flooding the market today. The question is, do I recommend Merkur blades for beginners? The answer is a resounding “No.” These blades are for “Experienced” shavers more than anything else. Quality stainless steel construction gives these blades an edge when it comes to durability. These blades are sharp; one can expect the same quality of shaving after three to five outings. When it comes to cutting coarse and thick beard, these products excel at the job at hand. Merkur stainless steel blades can be cross fitted into a number of single blade razors on the market. This blade is NOT for beginners who are just coming into wet shaving for the first time. 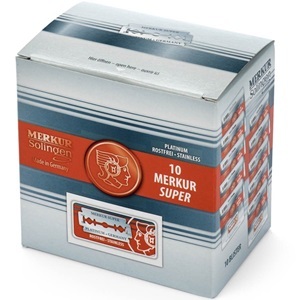 Merkur isn’t one of the best safety blades for sensitive skins due to the aggressiveness. 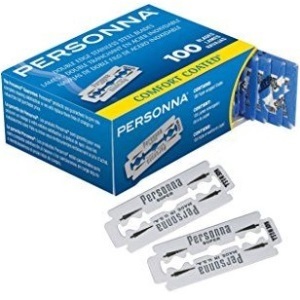 Since we are discussing best safety razor blades that are sharp as well, I thought of adding “Personna” on my list. These stainless steel blades are sharp. These are 25% sharper than the normal blades out there. As with Merkur, these are not for novice shavers as well. One must have a previous idea about using these blades. These blades are called “Personna Lab Blues” as well. One thing that interested me is the fact that 100 blades come in a carton. These are individually wrapped. It helps when people are trying to get one blade out of the carton at a time. Despite what you may think, these don’t fall through missing the mark. Even the experts are advised to handle these with care while shaving. Once you are done, make sure to dispose of these safely as well. So, why did I include them on this list? That’s because of the flexible construction and durability they offer. Persona blades do go well with many of the razors of this era. These flexible blades are “Barber” class as well. Meaning, they’re fit to be used in barbershops. If you didn’t notice, this package is stamped “Super Comfort.” It means, users will have a degree of leeway when shaving their faces and won’t get nicks and cuts that often. Another thing contributing to the ease of shaving is the “Glide Coating.” It allows the blade to move over your face without creating abrasions. People won’t feel skin tugs, rashes, and razor bumps as well. Not even with a razor like Merkur 180. Yes, it goes well with Merkur razors too! Personna is made in the USA. Naturally, the makers adhere to the quality control rules of this country. Again, these are not like conventional ones which go soft after you’ve had 3 – 4 outings with them. The lifespan of each product is about 6 – 7 shaves before they begin to go dull. The carton has a nice mechanism to ensure the safe interaction and usage of the blades. This is an USA-made blade strongly adhering to the safety standards suitable for this country. The “Glide Coating” technology ensures that the users don’t suffer unnecessary nicks and cuts. As far as sharpness goes, these blades are 25% sharper than some of the reputed brands. One can get six to seven shaves out of this blade depending on the frequency of shaving. Some of my friends mentioned the blades to be inconsistent when it came to shaving quality. Wilkinson is a revered name when it comes to shaving blades. “Wilkinson Sword Classic” is a blade that’s made with utmost care and numerous user benefits in mind. For example, these blades are made with quality stainless steel to grant the cutting power and prowess that they need. A Wilkinson blade cuts close. It’ll give you a smooth shave every time you use it. The “Chromium” coated blade does well to resist corrosion for a long time. Thanks to the coating, people will have top-of-the-mark shaving experience in areas where there’s a lot of iron in the water. On top of chromium, the makers threw in a bit of ceramic coating as well. This gives a Wilkinson blade smoothness when people handle them during the shaving routine. Thanks to this, the blade will glide smoothly over your face and won’t give you much of a trouble in terms of nicks and cuts. Wondering if the blades in the pack will cause irritation or not? Don’t worry at all! There’s the third layer of PTFE to the rescue! Thanks to this, these blades grant users an irritation-free experience while shaving. Also, there won’t be any rashes post shaving to trouble us men. Wilkinson Sword blades come individually wrapped in a large package. This allows each blade to be safe from getting dull and rusting. These blades are excellent when countering coarse and thick hairs. I didn’t experience uneven shaving performance with any of these. It’s safe to say that these are constant. A Wilkinson Classic Blade fits into any standard-size DE razor that you can throw it in. A 100-Blade pack fuels shaving for a long time. I mean, really long. Just to give you a clear picture, I can get 8 – 10 shaves out of a single blade. This is the most number of shaves (By Far) any of the products on my list could grant. The Wilkinson Classic blades have a rich legacy to uphold and they do so in spectacular fashion. These blades grant close and consistent shaves without nicking or tugging the skins of users. PTFE coating on these blades means that people won’t suffer burns, irritations, and rashes. Chromium paired with steel grants the cutting power to go through stubborn beards. These blades don’t corrode and can grant people 8 to 10 shaves with each without getting dull. I’m a fan of this brand and can’t find any fault with it. 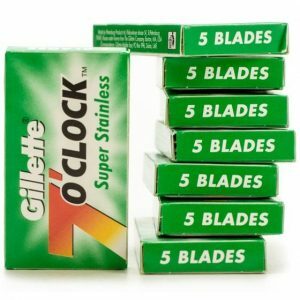 When discussing DE Razor blades, I couldn’t just leave 7 O’clock blades out of the list. My dad loves the brand alongside Wilkinson for a number of reasons. For all the right reasons, Gillette brought this franchise to light from Russia. Naturally, a people get superlative stainless steel construction. I could vouch for the sharpness of a 7 O’clock blade with my eyes closed. Dad shaves twice a week like me. And 7 O’clock grants him the sharpness needed to go through coarse and thick stubble. He needs a couple of passes to have a close shave that feels smooth on his skin, so he tells me. These blades aren’t “That” aggressive like some of the contenders on my list. For me, it’s a blessing. It doesn’t trouble dad’s sensitive skin that much. Also, these blades don’t pull on your skin. Use these with either a slanted or a straight razor if you like. The sharpness and the comfortable feeling remains the same. I should also mention that people won’t face any nicks and cuts while using these. These are gentle on our skin due to the method of blade polishing followed in Russia. Don’t confuse these with the “Indian” variety. Each small tuck comes with five blades straight out of St. Petersburg. Speaking of DE razors, 7 O’clock goes well with every one of them. Be it a Merkur or a Parker, pair your tool with one of these blades and enjoy a close encounter with your facial hair. At a price under $15, getting 100 blades is a winning bargain for wet shaving enthusiasts. These are Russian-polished blades that bear the stamp of quality stainless steel with them. I liked the sharpness of these blades; they go through thick stubble of beard like it’s nothing. A 7 O’clock blade is super gentle on our skins. It won’t nick or cut the skin in any way. People get 100 “Quality” blades at a price below $15 which is a convenient deal in itself! These blades are better than Personna Lab Blues in sharpness and smoothness for me. Certain Merkur Straight-Edge razors might present issues with these blades tucked in. 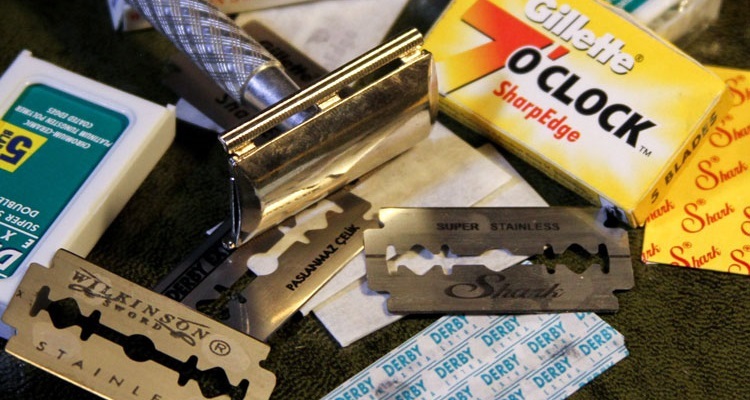 Let’s put a lid on our list of best safety razor blades with Shark DE blades, shall we? These are premium blades that combine craftsmanship with efficiency in performance. I could never doubt the stainless steel construction that grants sharp-edge blades with incredible cutting power. However, the cutting power doesn’t only rely on steel. In fact, the chrome foil on top saves these products from corrosion and rust. As a result, a blade has long shelf life unlike many of its price range. No, chrome doesn’t react with our skins and make rashes pop out during or after shaving. Another thing to note is the polymer coating that goes in these blades. Polymer makes these blades smooth and safe to handle. Users’ fingers won’t get cut. Also, the coating prevents water from sitting on top of these blades and damaging them to the point where further shaving isn’t possible anymore. Despite how “Sharp” these things are, they don’t pull on your skin. With the right razor, you won’t even feel a feather on your face. I’m not making this stuff up. Once people are done shaving, they should properly wipe Shark DE blades. Trust me, this much enough to get them ready for the next outing. Oops! Did I say, “Right Razor?” As it turns out, there are many “Right Razors” that can utilize the services of these blades. For example, one can pair these up with Merkur or Gillette DE razors. I understand a lot of my readers use “Gem” razors as well. As it turns out, sharp blades are good for those as well. At around $15, Sharp DE blades are one of the cheapest beard cutters available. While they don’t reach the level of a Merkur, Personna, Gillette or Kai; these blades belong to a comfortable mid-range spectrum. Considering the blade size is “Just” right, you have a quality brand to entrust your shaving duties to. The brand is a budget-friendly option for wet shaving enthusiasts around the globe. Sharp DE blades are durable options when people want blades that can serve them for weeks. Several coatings of chrome and polymer ensure that Shark blades don’t suffer corrosion or rust. I could never argue about the quality of shaves I got from using one of these for this review. 100 blades at a price under $15? A “Done” deal anytime, any day of the week. Certain DE razors won’t go too well with these blades at hand. 7 O’clock or Astra blades are better options. How I Selected These Blades for My List? Curious to know how I picked all these products from different brands for testing and reviewing? The short answer is that I looked into certain parameters and how each brand performs when judged by these parameters. I’ll be discussing the detailed process in this section. One thing you’d notice on my list is a variety (more on that later). I picked different brands with different sharpness levels and coatings. These brands counter different types of hair on a person’s face. Some of the aggressive blades do well in case of thicker stubble and coarse hair. Others cater to “Fine” pattern. For example, people with thick beards should go for Astra, Merkur or Personna blades. These blades perform well even on a three-day-old stubble. If the beard isn’t so dense, go for 7 O’clock and even Sharp for that matter. These are made for more shaves and less cutting power compared to earlier choices. Measuring the Quality of Your Skin Is a Good Idea Too! You’ll often hair people complaining about itches and rashes after shaving. Despite some similarities, our skin types vary from person to person. Some people have skins that react to the slightest bit of change in their habits. Others don’t feel things at all. Depending on that, blades and their qualities vary too! For example, best safety razor blades for sensitive skins are often not aggressive (like 7 O’clock). People with tolerant skin types should go for aggressive and sharper blades. Sharper blades are also good if you prefer to let your facial hair grow for a few days before cutting them. I Considered Different Experience Levels of People Too! It’s good to consider skin sensitivity and hair types when choosing a DE razor blade. What people neglect the most is their own experiences with a DE razor. Let me tell you, shaving with Safety, straight, and slanted razors are different things. One learns and gets the hang of these two in different ways. Whatever the case, if you a beginner with these razors, choose blades that are less aggressive on your skin. Beginners tend to stroke the DE razors too quickly or too slowly. With an aggressive razor, inexperienced users will be prone to nicking and cutting. That’s why you’ll see a good mixture of aggressive and smooth blades on my list. I understand people don’t value durability that much when it comes to shaving blades. But I do. For me, getting the maximum usage out of my products takes just as much priority as its quality. In fact, I deem the fact another aspect of “Quality.” It depends on how coarse or thin your beard is. Also, the lifespan of a blade varies due to shaving frequency of a user. Even then, I’ve chosen blades that can dish out 4 – 8 shaves on an average. When people are buying in bulk, this is an aspect they should pay close attention to. It can help them save a few bucks. The consistency of These Blades Was Important Too! If I can guarantee my readers one thing, that be the fact that there are no “Fluff” products on my list. That’s because I measured the quality of my (and my father’s for once) shaves before recommending these stainless steel pieces. All of these products passed the benchmark. I couldn’t offer up a brand that is inconsistent with the outcome from blade to blade. I had strict parameters set in place. It took me several weeks to see if each of the blades stacks up to the “Closeness” of the shave that I desire or not. To my satisfaction, they did. Blade Size Was Important Too! I’ve already touched on people getting nicks and cuts with blades for safety razors. Besides experience, blade size plays an important part in this case. For example, if your brand is too big or small for the razor you use, it can create a weird angle and drag onto your face. The result? Nicks, cuts, and even bruises will trouble you for days. That’s why I’ve chosen blades that are more or less “Universal” in size. In simple terms, these will fit most DE razors available. When choosing yourselves, go for blades that have a width of 1-11/6” to be on the safe side. This is what I did and advise all my readers to do as well. People should weigh their safety razors before choosing a blade. With a heavy razor by their side, users don’t have to put that much pressure behind each stroke. The blades will easily move through the stubble of beards. Yes, even when they’re dense. On the other hand, with the lightweight razors, users need to pull them with pressure to cut through stubborn facial hairs. When dealing with a heavy razor, choose a “Medium-Sharp” blade like 7 O’clock. Lighter razors warrant aggressive and sharp blades like Personna and Merkur to name a few. I found my soulmate in Astra from Gillette. So, my search for best safety razor blades ended quite early. Even then, I toiled just to see which of these brands came close to defeating Astra in terms of performance and quality. I must say, I was surprised. My research handed me blades with varying degree of sharpness and smoothness. Now, I can say that different blades are good at catering to different things. Some blades are good for people with sensitive skins. Others do well for shavers with a thick beard. All you need to do is pick the right one. With my input and buying advise, it shouldn’t prove too difficult. Make sure to double check the number of blades and the price you are paying for them. It all comes down to the fine balance between price and performance. 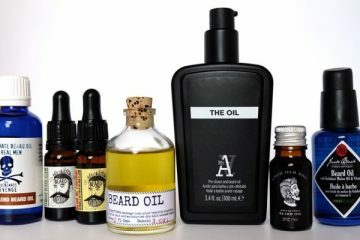 The Only Guide to Best Pre Shave Oil You’ll Ever Need!